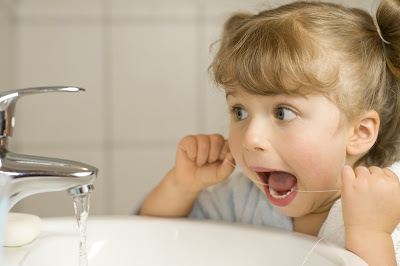 Ways To Make Flossing Fun - Adelberg Montalvan Pediatric Dental PC & Orthodontics too! Emphasizing the importance of flossing and gum health to kids is more difficult than it seems. Are you a parent of a child that isn’t the biggest fan of his/her nightly dental routine? You’re not alone! There are more than enough ways to make flossing fun, so here are a few of our favorites! A reward doesn’t have to be tangible such as a new toy or book, but it can be some extra time playing outside, a story before bed, or going to a friend’s house after school. We all enjoy picking out our own things or the stuff we like, so why not do the same with oral hygiene products? Let your child choose his/her mouthwash, the color of their toothbrush or floss! This can help bring excitement to the sink with their personal preference. Put together rhythms and rhymes, make it silly or serious, but try to have fun with it! Children tend to mimic those they look up to. As a parent, they see you doing things every single day, and this is where great habits can form. Floss together and show them how! For additional information and flossing tips, contact us today!